Preface; Part I. Plasma Physics Preliminaries: 1. Introduction; 2. Elements of plasma physics; 3. 'Derivation' of the macroscopic equations; Part II. Basic Magnetohydrodynamics: 4. The MHD model; 5. Waves and characteristics; 6. Spectral theory; Part III. Standard Model Applications: 7. Waves and instabilities of inhomogeneous plasmas; 8. Magnetic structures and dynamics of the solar system; 9. Cylindrical plasmas; 10. Initial value problem and wave damping; 11. Resonant absorption and wave heating; Part IV. Flow and Dissipation: 12. Waves and instabilities of stationary plasmas; 13. Shear flow and rotation; 14. 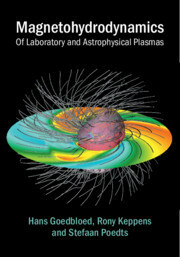 Resistive plasma dynamics; 15. Computational linear MHD; Part V. Toroidal Geometry: 16. Static equilibrium of toroidal plasmas; 17. Linear dynamics of static toroidal plasmas; 18. Linear dynamics of toroidal plasmas with flow; Part VI. Nonlinear Dynamics: 19. Turbulence in incompressible magneto-fluids; 20. Computational nonlinear MHD; 21. Transonic MHD flows and shocks; 22. Ideal MHD in special relativity; Appendices: A. Vectors and coordinates; B. Tables of physical quantities; References; Index. Hans Goedbloed is Advisor of the Dutch Institute for Fundamental Energy Research (DIFFER), and Professor Emeritus of Theoretical Plasma Physics at Utrecht University. He has been a visiting scientist at laboratories in the Soviet Union, the United States, Brazil and Europe. He has taught at Campinas, Rio de Janiero, San Paulo, Massachusetts Institute of Technology, Katholieke Universiteit Leuven, Belgium, Amsterdam Free University and Utrecht University. For many years he coordinated a large-scale computational effort with the Dutch Science Organisation on Fast Changes in Complex Flows. Rony Keppens is Professor and Division Chair at the Centre for mathematical Plasma-Astrophysics, Katholieke Universiteit Leuven, Belgium. He headed numerical plasma dynamics teams at FOM-Institute for Plasma Physics 'Rijnhuizen' (now DIFFER) and Leuven and frequently lectures on computational methods in astrophysics. His career started at the National Centre for Atmospheric Research, Boulder, and the Kiepenheuer Institute for Solar Physics, Freiberg. He held a professorship at Utrecht University and a concurrent professorship at Nanjing University. His expertise ranges from solar to high energy astrophysics and includes parallel computing and grid-adaptivity. Stefaan Poedts is Professor and Chair of the Department of Mathematics at Katholieke Universiteit Leuven, Belgium. He was a post-doctoral researcher at the Max Planck-Institut fur Plasmaphysik, Garching, a senior researcher at the FOM-Institute for plasma physics 'Rijnhuizen', and research associate at the Centre for mathematical Plasma-Astrophysics, Katholieke Universiteit Leuven, Belgium. His research interests include solar physics, space weather, thermonuclear fusion, MHD (in) stability, and multi-fluid modelling. He teaches basic math courses, and advanced courses on plasma physics of the Sun and numerical simulation.